YoMo’s management committee approved the recommendation to make these pledges at their meeting on 6th July 2016 and since then YoMo has agreed their Action Plan to meet the above pledges, and published their Census baseline data. As a result YoMo has obtained the right to use the Charter Mark. 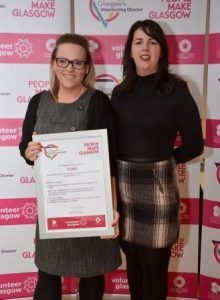 As one of the first five organisations to do so, Pauline and Yvonne from YoMo collected their Charter Mark certificate from Volunteer Glasgow on 27th January 2017 (pictured below). YoMo’s senior officer with lead responsibility for volunteering is the Project Co-ordinator, Linda McGlynn. Linda’s contact details are: linda@yomo-online.co.uk or 0844 414 8296.